Colour: Transparent with ivory plastic spiral. 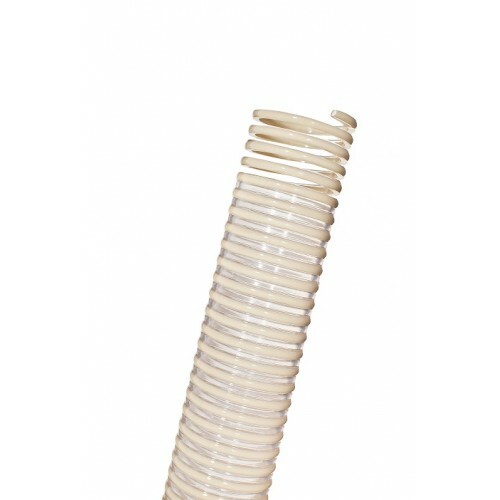 Properties: Food grade hose completely free from phthalates in order to eliminate the leaching risk of those components into the delivered substances. The hard plastic helix is food grade as well as the wall, making Nettuno FF a total food hose. Resistant to loads, atmospherical agents, ageing, UV rays, ozone, hydrolysis and many chemicals. Halogens Free and conform to RoHS. Standards: Food grade according to EU Regulation n° 10/2011 (classes A, B, C and dry food). It is not suitable for milk, dairy products and fatty foods, RoHS 2011/65/EU Directive, REACH Regulation (1907/2006), TRB S 2153. Ideal solution for suction and delivery of powders such as flours, grains, freeze dried foodstuffs. For liquids in general and beverages, fruit juices, vinegar, wine and liquor with alcohol concentration up to 20%.